Competition Time – Win a Mascot Experience. Would you like the opportunity to lead your heroes out before a game? Well now’s your chance. Exclusively for Junior Blues members, you could win a mascot experience for a home game next season*. We want to spread the Chester Football Club name far and wide and you can play a part in that. Travelling to Spain for a beach holiday? Off to the U.S.A. on a city trip? Or staying in the U.K. to enjoy everything it has to offer? 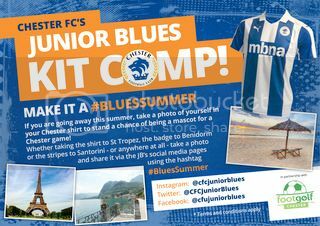 Simply get a snap of yourself in your Chester shirt while on holiday, share it to one of social media pages on Facebook, Instagram or Twitter using #BluesSummer and you will be entered into a prize draw to win a mascot experience at a home game next season. The prize includes the opportunity to meet Jon McCarthy and his players, have a guided tour of the ground and of course, get to lead out the lads before the game. We will also throw in two adult tickets. The closing date for entries is 11.59pm on Sunday 4th September 2016, so get those snaps in. *By entering the competitions you consent to us publishing your name and/or photograph if selected in our Newsletter, Magazines, Programmes or on our website or via any other method, including our social media pages. We will NOT publish any other personal details including addresses, telephone numbers, or email details or pass on any details to a third party without your Parent’s/Guardian’s written consent. Please note we do not have alternative prizes to those advertised. The chosen game will be decided with agreement of Chester Football Club. The prize draw will be held on Tuesday 6th September 2016. The winner will be notified by either email or telephone within two days of their name being drawn.